The river. Hot and lazy under June sun. If I happen to feel like a swim, though, it’s a long stumble over sunbaked rocks for a hundred yards to get to the water. I stub my toes a dozen times. A persistent horsefly circles my head, buzzing evilly. When I finally reach the water, it’s brownish, murky, lukewarm. I wouldn’t trade my river (the Schoharie Creek in upstate New York) for a thousand swimming pools with crystal turquoise water. I’ll take the smell of river mud over chlorine any day. Crayfish nibbling my bare feet? Dragonflies whizzing past? Not a problem. But wait. What about germs? Pollution? Dirt? Pools are sanitary, filtered, chlorinated. Safe. Mm, maybe, but watching the stew of humanity bubbling in the local pool, I’ll take my muddy river any day. Mud, yes. Pollution? I pick up a rock, any rock at random, and a little brown insect about half an inch long wriggles across it. It’s a stonefly nymph, an aquatic invertebrate that’s highly susceptible to pollution. Their presence is an indicator of high water quality. I prefer bugs I can see to those I can’t. 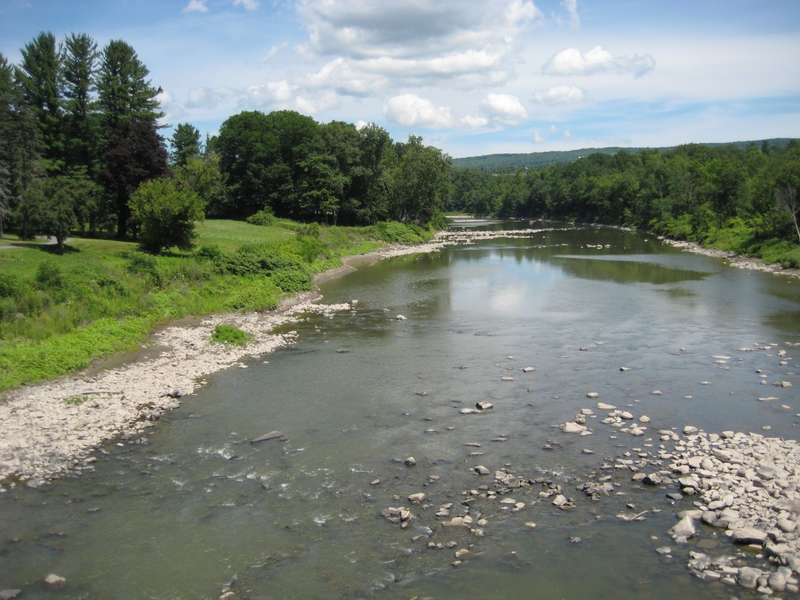 In the last heat wave I spent a lot of time neck-deep in the Schoharie Creek. The current of cool brown water flowed endlessly past, caressing my skin like satin. Damselflies perched on me as I drifted with the stream. Gonna lay down my burdens, down by the riverside. Love this immersion in your quintessential creek! All the lovely elements are there. Thanks for posting.